Welcome to the Regina Centre's RCCO page. You can write to us (well, our Centre President) in the Contact Us boxes waaaaaay at the bottom of our page. Me, I'm Allan, the Regina Centre Website Dude, and the host for the duration of your voyage here. To skip down faster, we offer these handy shortcuts below, but you'll have WAAAAY more fun just scrolling back in time and looking at the pictures! Note: You can expand any of the pictures on this page by right mouse clicking on the image and selecting the View Image option. Click on the following to view: 1. News 2. Regina organs 3. Moose Jaw organs 4. Contact Us. Jan. 13, 2019: Valerie Hall performed an organ recital at Zion United Church in Moose Jaw, Saskatchewan, entitled "Music for a Winter's Eve." Valerie always brings plenty of game, and was on fire tonight. She played not one, but TWO different Suites du Deuxieme Ton (Clerambault and Bedard). Another JS Bach piece I hadn't heard before, featuring a big pedal solo. Led with a Buxtehude piece. The emcee and host organist at Zion is Bruce Learmonth, who had us downstairs for post-concert refreshments courtesy of the Zion United volunteers. Oct. 13, 2018: The Conservatory of Performing Arts now offers organ lessons (from Valerie Hall) on an organ newly installed there. On this day she hosted an organ crawl there to introduce the organ to RCCO Regina -- let's call it Organ Crawl IX: Cacaphony at the Conservatory. It's the first one I have missed, in this crawl series stretching back to 2013. So -- I can't tell you much about the crawl. I'll get over there and check out the organ for myself sometime. Aug. 19, 2018: We pushed up our Annual General Meeting to August this year (we used to have it in November during CFL playoff season). And dad gum it, they done went and let me stay as El Presidente of the Regina Centre for a 3rd consecutive year. This time instead of in the bank vault at Atlantic Cafe, we had the meeting at Lynn Cavanagh's new place. There was wine, and a cat. The Pipe Organs of Moose Jaw On this day, we at RCCO Regina/South Sask were lucky enough to see all three of Moose Jaw’s pipe organs in one single day! To keep the numbering scheme, this would be Organ Crawl VIII: the Moose Jaw Trifecta. The Trifecta was made possible by Bruce Learmonth, the organist at Zion United, who at one time or another has been the organist at all three of the churches! A big thanks to Bruce for arranging everything, including lunch and final snack social. In 3 different cars, four of us Reginans (Jackie Chase, Lynn Cavanagh, David McIntyre, and yours truly Mr. President) converged at 11am at the 1st stop, St. Aidan Anglican (https://www.staidan.ca). John Langford, a longtime St. Aidan member and organ helper, was our host, and even let us up the ladder into the guts of the organ. Thi s 3-manual organ, a 1931 Woodstock, has pipes that are even older but had to have the console replaced in 1931 after a lightning strike. The console looks awesome, like a theatre organ, with its pretty coloured lever-stops. Despite the 3 manuals, one lacks its own ranks: Great, 4 ranks; Swell, 9 ranks; Pedal, 4 ranks. All ranks are either 16’, 8’, or 4’, and features some pretty reeds and melodic flutes. In 1997 Steve Miller updated the organ from electro-pneumatic to electronic (Bruce found the old newspaper article describing this). I tried out my In Dulci Jubilo by Bach on it. We then headed to the old CPR railway hotel, in whose restaurant (Grant Hall) we hooked up with Bruce Learmonth and had lunch. Bruce had reserved for us a table in a gorgeous huge private room with its own fireplace, but since we were only 5 people we saved some $$$ and ate in the regular space. Oh yes the food was yummy. Somebody ordered dessert too, so, well, we all did. Next stop was St. Andrew’s United Church (http://standrewsmoosejaw.ca). This church originally had a “5-manual” Casavant with a 4-manual console from 1913. During a 1954 restoration by English organ builders, a 5-manual console was installed, as well as 600 more pipes (for 3200 in total). St. Andrews had a copy of the programme from the 1954 inauguration recital, by St. Andrews organist and choirmaster Frank Godley. In it is mention that this was only the 4th 5-manual organ in Canada in the day (1954), “the others being in Toronto at Metropolitan and Timothy Eaton Churches and the Royal York Hotel.” In 1963 a fire caused by a wiring shortage destroyed the church except for the exterior walls! 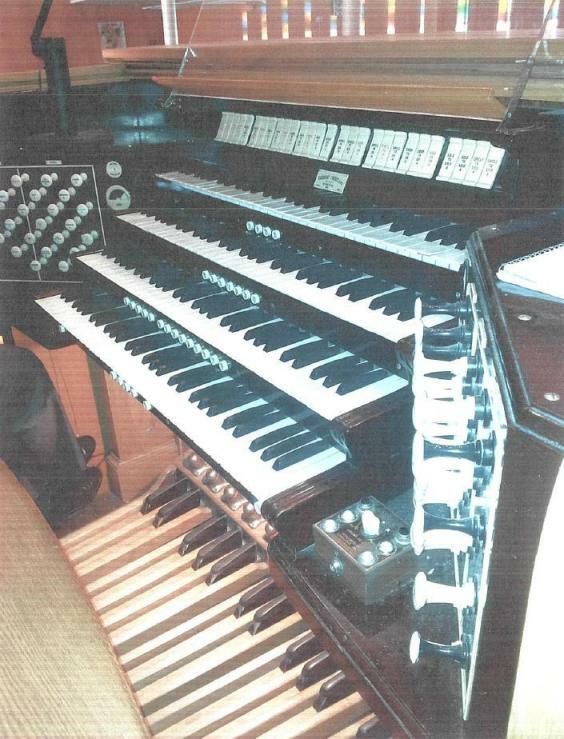 As part of reconstruction, in 1966 the Wicks Organ Co. of Highland Illinois built and installed the current organ (2549 pipes, 43 ranks, 59 speaking stops, 4-manual console) in the restored church. On this organ I unleashed the Toccata in Dm by Bach. I remember Bruce smiling when David McIntyre briefly tried out the tremulant. During our time there, we could hear outside a brief but fierce downpour of rain. Our final stop was Zion United (https://www.facebook.com/zionunitedchurch), right on Main Street. This organ began as a 3-manual Casavant from 1907 (Opus 297), whose original specifications Bruce still had: “Action to be tubular-pneumatic through-out. Organ to be blown by a water motor to work direct on organ bellows at 50 pounds water pressure. 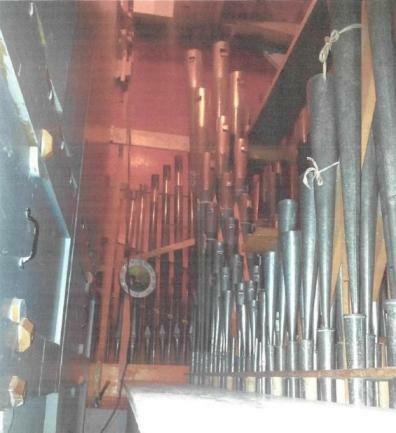 Water pipes to be at the charge of the church.” A 1992 listing of the ranks reveals some changes over the years: a Melodia on the swell, a 2 2/3’ Nazard and 4’ Chimney Flute on the choir. In 2013 one wind chest collapsed and the second was not in good shape, so in 2014-15 at a cost of $22,500 (covered by a Zion couple) both wind chests were restored by Mantle & Buck (Winnipeg). Here, Bruce got on the organ and played two pieces for us to show off his “home organ.” I had a run at the Fugue in Dm by Bach and only derailed 2 or 3 times. At all 3 venues, all 4 of us got to experience playing and listening to these fine instruments in beautiful churches. All are within walking distance of the famous mineral spa and the Tunnels tourist district. Oh and I forgot to mention (though you’ll see it in the photos): two of the three organs had paint-decorated pipes (we don’t have that in Regina). To finish up, Bruce fed us in Zion’s “party room” with fruit and cheeses and sparkling fake champagne as we had some final chatting, before we got back on the Trans Canada Highway and headed home to Regina. I can’t begin to tell you how much fun that trip was! More photos are at the bottom of the website (click [here] to jump down). Item One: Ladies and Gentlemen, we are excited to announce that New York City touring organist Gail Archer will perform an upcoming organ concert in Regina. Judging by her touring schedule (see www.gailarcher.com) this may be her 12th concert in 4 months; this month (March) she has apparently played in Rhode Island, Alaska, and Spain. If you have never heard a Friday the 13th organ concert, well, my friends ... ahhhhh ha ha ha haaaaaa! Item Two: The Regina Music Festival organ performances are scheduled for 1 pm Thursday April 12th at St. Paul's Anglican Cathedral in Regina. Gail Archer will be adjudicating two students, eight pieces total: Bach, Bedard, Dupre, hmmm Merkel don't know that one, interesting. Item Three: We did indeed hold our Lent-and-Holy-Week music-sharing event at Central Lutheran this past January 28th. The organ was a quite decent Allen organ (which may need a new home, as the church is closing later this year and the building may change hands!). I tried out a "Herzlich tut mich verlangen" setting for hands by Walther. Also tinkling the non-ivories were David McIntyre, Valerie Hall, Jackie Chase, and host Lynn Cavanagh. Right-click on photo and select 'View Image' to enlarge. We have an RCCO Regina Event this weekend! The event: an informal gathering of organ music lovers where we each share lenten/holy week music, by bringing more than one piece that you like, and playing at least one excerpt to demonstrate the piece(s)! Lynn asks that you RSVP her (lcavanagh@sasktel.net), perhaps by Thursday 4:30, so that she can estimate number of attendees if she gets asked. Lynn, consider this my RSVP -- I'll be there! Nov. 16, 2017: We have had our annual general meeting this past Sunday, at Atlantis Cafe in Regina. My hot chocolate had LOADS of whipped cream on top. It was good. I'm still El Presidente and website overseer. I got to do a President's Report at the meeting! So I found some stats, and marvelled out loud at how Edmonton could have 42 members while we sit at 13. But now as I'm typing this, I looked up the metro populations: Edmonton 1392600, Regina 247200 (http://www.statcan.gc.ca/tables-tableaux/sum-som/l01/cst01/demo05a-eng.htm). So, the percentage of citizens who are local RCCO members is 0.0053% for Regina, and only 0.0030% for Edmonton. We beat them per capita!!!!!!!! 1. Last September 28th, Regina RCCO member Valerie Hall performed an organ concerto with members of the Regina Symphony Orchestra at St. Mary's Anglican Church here in Regina. In the photo, you can see Valerie's head at the left, under the golden pipes, look caaarrreeefullllllyyyy,. It was a very nice piece! Too bad I don't remember the name of it. They also performed a few other pieces to fill out an entertaining and well-attended evening. Free wine downstairs afterwards!!! Proceeds went to the St. Mary's Elder Community. 2. Regina RCCO member David L. McIntyre reports that he has just finished and published Volume 7 of his Organ Notebook series, which you can order by e-mailing him: see https://davidlmcintyre.com/roy-street-music. Actually I don't think his website mentions Volume 7 yet -- aha, see, a news scoop from your ear-to-the-rails (-to-the-ground? Nose-to-the-ground?) Regina reporter. Dec.7, 2016: Well I have shocking news. We just had our annual general meeting two Sundays ago (during the Grey Cup game - I didn't expect the game to be close, boy was I wrong), and as Fate and possibly other Deities would have it, I got promoted from Website Dude to President of the Regina Centre. (Oh but I agreed to still keep my Website Dude position.) I thought I would first become President-Elect, you know like Donald Trump right now, but no, apparently I am good to go. May 3, 2016: Merry Springtime! It really wasn't a bad winter here in Regina, and wow is it warm today. I think it will be over 25 Celsius. Secondly, please note the upcoming organ recital by Valerie Hall Sunday May 29, 7:30 pm, at St James the Apostle Anglican (1105 Empress St., Regina). This was the site of our Organ Crawl VI: The Shindig at St. James last September (see October report and photos below), where we discovered a well-kept beautiful old organ from Hinners Organ Company of Pekin, Illinois. Come hear a rare concert on a well-kept Hinners! Nov. 26, 2015: A jovial hello from the prairies yet again. Last Nov.14 (the day after Friday the 13th, ha ha) we proudly partooketh in Organ Crawl VII: Jammin' at S.M.V.. Seven crawls in 2 years, which is probably more that we thought we would do. They're fun! 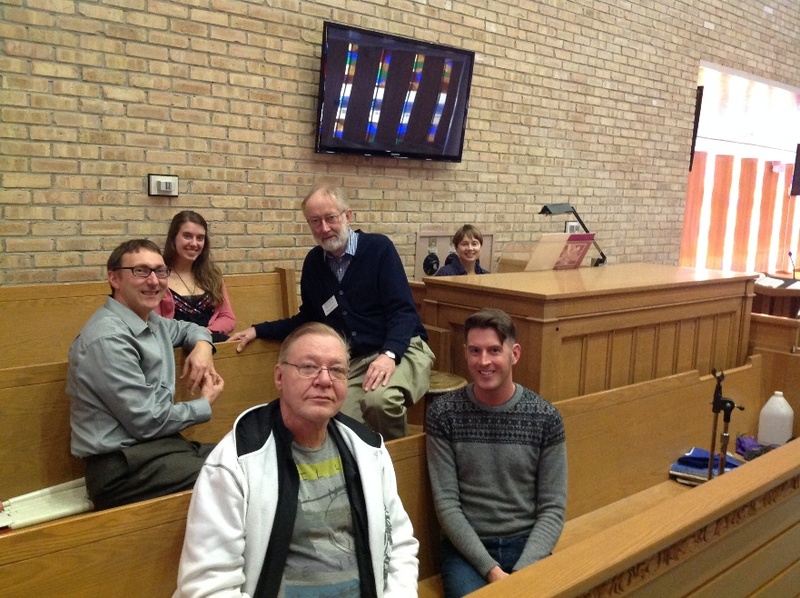 This time around, we sauntered over on a Saturday morning to St. Mary the Virgin Anglican (15th Ave) where we were hosted by the venerable Roy Norberg, well known in Regina organ circles and who reports being in his 48th year there! One of the photos shows him seated at the console. This Casavant organ was in quite good shape and Mr. Norberg gave a very nice verbal and aural introduction to it, including a tour around the inside of the organ. For more pictures of the organ click HERE. It is only the 2nd time I have been inside an organ while it has been played. One row of pipes had cute neckerchiefs as if they were primly lining up for dinner. Lynn Cavanagh: Nos. 1 & 2 from Cinq Versets by Charles Tournemire. Nov. 2, 2015: We had our annual general meeting on October 25th at Atlantis Cafe. I'm still our webpage coordinator, woot woot! And we are proud to announce Organ Crawl VII: Jammin' at S.M.V.! We are off to St. Mary the Virgin Anglican (15th Ave) on Saturday, November 14 at 11 am to sneak a peek and pop some stops on a Casavant from the 1940's. Oct. 24, 2015: I know, I know, where is the report on Organ Crawl VI, you are all wondering. Wonder no longer; here is the report! The Shindig at St. James did happen. What we found at St. James the Apostle Anglican Church was an organ older than the church(! ), from an American organ maker of long ago (Hinners Organ Co., Pekin, Illinois) , with beautiful wood cabinetry. For more pictures of the organ, click HERE. David McIntyre: a piece of his own composition! Also in attendance: my wife Sandra, daughter Frida (3), and son Tony (11 months; he took the "crawling" part of the organ crawl literally). Sept. 14, 2015: Attention attention: another Organ Crawl extravaganza is coming our way. What better way to take a break from election campaign poll watching than to zither on over to Organ Crawl VI: The Shindig at St. James. This time (Saturday, September 26 at 11 am) we steer our transplanetary hovercrafts out to West Regina to try out the Zaphod Beeblebrox organ at St James the Apostle Anglican Church, 1105 Empress St., Attendees are encouraged to bring a short voluntary to play. C'mon out and see what organs sound like at the end of the universe. Sorry, no Pan Galactic Gargle Blasters provided. I couldn't find the recipe. If you bring one, I'll give you 5 bucks. June 1, 2015: We had 3 contestants at the Gordon Wallis competition in April: Mars Zhao and Tatiana Orlowski (students of Valerie Hall) and Tanya Bergen (student of Hart Godden). The three collectively played 6 fabulous pieces. The prize winners were: 1st ($350) Mars, and 2nd ($150) Tanya. Congratulations! A Regina organ made the cover of last month's Organ Canada magazine! (The organ is incorrectly ascribed to being in Saskatoon, but really it is here in Holy Rosary Cathedral.) A nice article on Holy Rosary's organ scholar program appears in the issue. The James McVinnie concert here in Regina was fun and well attended. I would say my favourite piece on the evening was the Rhosymedre by Vaughan Willams. (You may know it; it goes bah bah-da-dahhhh da da da bah bah-da-dahhhh … ). 1. Organ recital April 15th, 2015, 7:30 pm, Holy Rosary: James McVinnie. See March 10 news below for details. 2. Gordon Wallis competition, April 14th, 2015, 7:00 pm, Holy Rosary: Contestants vie for $500 in scholarship money, performing 2 pieces each. This competition is being resurrected after several years iin hiatus, and is open to Saskatchewan residents (a Sask Health card is considered proof). For details and entry form, please contact us (bottom of this webpage or click here). The public is most welcome to attend. 3. James McVinnie Master Class for the contestants, April 14th, 2015, Holy Rosary, right after the competition. March 10, 2015: We are quite excited to announce a recital by Westminster Abbey assistant organist James McVinnie this April 15th, 2015, 7:30 pm, at Holy Rosary Cathedral in Regina. Click to see an Advertisement or recital program. We also will be shortly announcing a Gordon Wallis competition for the evening before, April 14th, adjudicated by James McVinnie. Barbara Reul: two settings by Laura Ann Page: "I saw three ships" and "Hark the herald angels sing"
Allan East: two short hands-only chorales by Friedrich Zachau: "Allein Gott in der Hoeh sie Ehr" and "In dulci jubilo"
Oct. 27, 2014: We had our rambunctious Regina Centre Annual General Meeting last night, in the Bank Vault room at Atlantis Cafe (yes it really was a former bank vault.) Organ Crawl 5 is imminent: Nov. 8th at Our Savior's Lutheran Church (190 Massey Road)! Lynn Cavanagh: Air and Canon on 'Draw Us in the Spirit's Tether,' from Book of Life (J. Biery), and a hymn setting of 'Draw Us in the Spirit's Tether,' tune by Percy Dearmer ("Union Seminary"), text by Harold Friedell. May 5, 2014: On Saturday May 3 we had our event Organ Crawl 3: Jammin' at Blessed Sacrament. This is the oldest Catholic church in Regina, with some beautiful stained glass windows and super acoustics. We were hosted by ever-so-kind Gaetan Hammond who is the new music director at the church. He is not an organist himself (oh Gaetan it's not too late to learn, ha ha). Currently they are having a set of 3 organists rotating to cover Sunday services as they adjust to the retirement of their longtime organist Betty Draper. Did you know that Armsdorff died on December 31st, 1699? He was 29. Poor guy -- missed seeing the 18th century by one day. April 22, 2014: Happy Earth Day! And do you know what makes Earth so happy? Organ crawls! Organ Crawl III will be May 3rd at Blessed Sacrament. Check our events page. April 17, 2014: Just received news that Dorothy Mae Copithorn (nee Spencer) has passed away at age 94. She was a charter member of the Regina Centre of the RCCO. Here is an obituary. 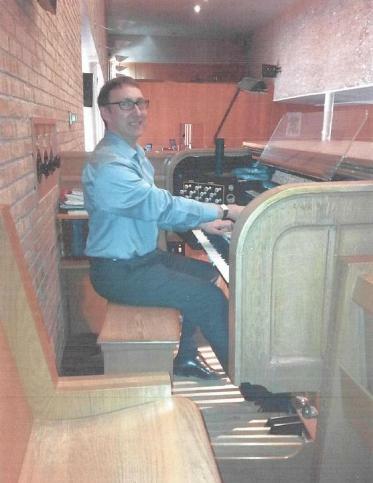 April 5, 2014: Tim Pyper from Calgary is coming to give an organ recital Wednesday, May 7th; see our Events page. April 4, 2014: On Wednesday April 2, the organists had their moment in the sun (tinted by the stained glass) at the Regina Music Festival. Dr. Lynn Cavanagh adjudicated the performances of Mars Zhao (3 pieces) and Tatiana Orlowski (4 pieces); both players were in the 16-and-under division. Here's a photo of Tatiana, Dr. Cavanagh, and Mars after the performances. Valerie Hall: Alleluia from Five Liturgical Inventions by Victor Togni (Canadian, 20th cent.). Ron Goodwin and Robin Swales also attended. Nathan is the new residing organist at Lakeview and opened with stories about how he got started in organ and the things he does for Lakeview services (he gets to operate the outdoor church bells with the manual -- cool). Oh and he provided chocolate, yes your trusty reporter has an eye for the details in a story. Some photos from the Toodle Doo are below. Since we're having too much fun to stop, Organ Crawl 3 is planned for sometime in May. Feb. 12, 2014: The Regina Music Festival is having its Organ competitions on Wed. Apr. 2nd, starting at 2pm at Holy Rosary Cathedral (13th avenue). If there is a fee for listening, it's probably so small that it would be well worth it! Nathan Pylypuk and Robin Swales also attended and joined in the camaraderie. The Grey Cup parade got past the church just before we started. It was a bit cold in the sanctuary though, because the church had let parade spectators come in to the church entrance to warm up and have coffee. Some photos from the Jam are below. We enjoyed ourselves so much, we're hoping to check out another organ in February for Organ Crawl 2! Nov. 18, 2013: the Roughriders have advanced to the Grey Cup game, in Regina next Sunday. If anyone from the Hamilton RCCO chapter is reading this, we are willing to bet 1 loaf of bread that the Roughriders will beat your Tiger-Cats next week! (Actually the Tiger-Cats is still my favourite team from when I lived in St. Catharines, so I wouldn't mind losing this bet...). Also, we have a totally rocking and original event next Saturday morning -- see our Events page. I think it's open to the public, hmmm hafta check with the chapter President on that one. If anyone has links to photos of other organs in Regina (or South Saskatchewan), let me know.